The Taj Mahal is aptly called a "dream in marble". It is a monument to the love between Mughal Emperor Shah Jahan and his second wife, Empress Arjumand Bano Begum. Emperor Shah Jahan christened Arjumand Bano Begum as "Mumtaz Mahal", which means the "chosen one." Mumtaz Mahal passed away during the birth of their 14th child, when she accompanied Shah Jahan on his Burhanpur military campaign. Mumtaz Mahal is believed to have secured a promise from her devoted lover and husband during her last breath that he would construct the most beautiful memorial in the world for her. Many designs were submitted to the Emperor but, ultimately, the design of Ustad Isa Afandi of Turkey was selected and the construction of the Taj Mahal started in December 1631 and it was completed in 1648. It is believed that Emperor Shah Jahan wished to construct a mausoleum that would be a replica of the Taj in black marble for his own tomb. This plan never materialized and the emperor was laid to rest beside Mumtaz Mahal in the Taj Mahal. More than 1000 elephants were made to transport construction materials during the construction process. 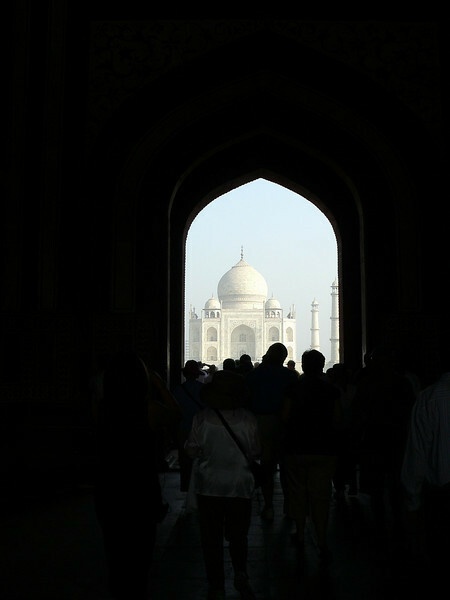 Artisans, architects, stonecutters, masons, calligraphers, inlay design experts and garden designers were summoned from different parts of the world to help construct the Taj Mahal in Agra, India. Approximately 32 million rupees were spent for the construction of this monument and about 28 different varieties of semi-precious and precious stones were used to decorate the Taj with exquisite inlay work. Each and every stone at the entire Taj Mahal complex is in perfect symmetry. The only asymmetrical thing in the entire complex is the Emperor Shah Jahan's resting place that was constructed later by his son Aurangzeb. According to common belief, Shah Jahan is said to have debilitated all the workers and craftsmen who were involved in the construction of this massive mausoleum so that they could never build anything like this ever again. Taj Mahal is one of the Seven Wonders of the Modern World and is a UNESCO World Heritage site. Individual captions aren't really necessary for this album.